Click on the image below to be taken to a 2048×1638 pixel high-res image suitable for a desktop background or for printing. You can then drag-and-drop or “save as” to your location of choice. 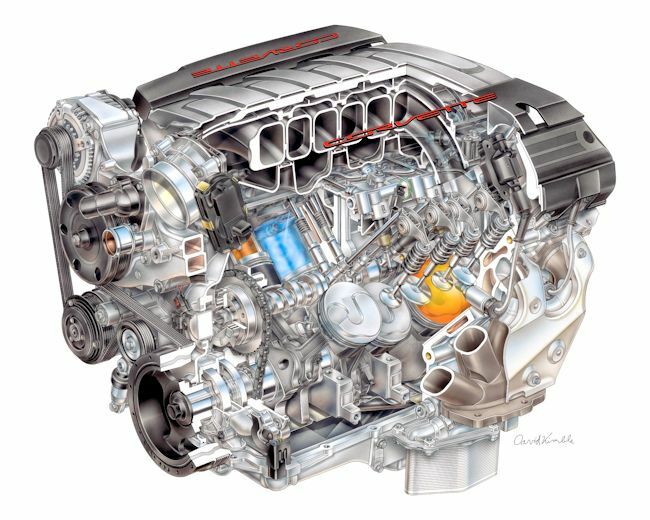 The new LT1 engine is a 6.2 liter 90-degree all-aluminum sleeved OHV V-8, part of an all-new GM engine family to be built in the familiar GM engine plant in Tonawanda NY. The engine features direct injection, cylinder shut-off, and cam phasing. Not true variable cam timing, because the intake and exhaust timing are varied in sync. The engine will run as a V-4 under light throttle and cruising. Optional on an unannounced model will be dry-sump oiling.